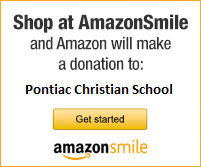 The purpose of Pontiac Christian School is to assist parents in guiding their children towards academic, spiritual, physical, social and emotional maturity. We strive to graduate students who are prepared for the academic rigors of higher education and who have the Christian character and faith to live their lives for Jesus Christ. The heart of our school is the teachers who serve as the “Living Curriculum.” Our dedicated and experienced staff is devoted to the success of each student and they provide their students with a daily example of Christian love and faith. The curriculum is based on biblical principles. Textbooks are carefully chosen to insure proper content, appropriate challenge and consistency with the Christian philosophy of education. Stanford Achievement Test results have consistently shown our students perform above average at every grade level. Complimented by extra-curricular activities, graduates of Pontiac Christian School transition well into high school, prepared for advances studies. The goal of moral instruction at Pontiac Christian School is to help each student develop Christ-like attitudes and behaviors in an atmosphere of love and encouragement. Students and staff are encouraged to express their faith and apply the Word of God to every aspect of their lives. We believe the Bible is the inspired inerrant, Word of God, and that Jesus Christ has provided salvation to all who receive Him as Savior. Our curriculum supports the belief that man and all other life were created by God, not by an evolutionary process. As members of the Illinois Elementary School Association, our students participate in basketball, volleyball, cheerleading and baseball. In addition, students take part in the Regional Spelling Bee, as well as Scholastic Bowl. Throughout the year there are a number of special events for the school community, including the Christmas Concert, Fall Fest, Threshermen’s Day, father/son basketball, mother/daughter volleyball, Jogathon, and Track & Field Day.